The 2012 BCS Alabama National Championship rings pay tribute to one of the most dominant, dynamic teams in college football history. The commemorative rings honoring the Crimson Tide’s big win over Notre Dame in January feature AAA cubic zirconium stones, all individually prong set (not glued). The detail on these rings is said to be very solid and for the price you should be getting an outstanding ring that is solid—not hollow as you may see some sellers offer. There are a couple of varieties out there but the most popular 2012 Alabama championship rings feature three footballs at the top representing the most recent national championships, the script 'A' in the middle with stones throughout. The side of the ring shows the score of the BCS title victory over the Irish. 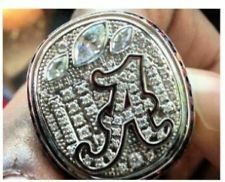 Several different sizes are available and the same eBay seller offers the 2009 and 2011 Bama championship rings as well. See listings below. The 2012 Alabama National Championship rings are hot items. The Tide is about as close as you can get to a college football dynasty and this ring commemorates a truly historic time in this storied football program’s history. The rings are a terrific conversation piece and collecting championship rings of all kinds is a fast growing element of the sports memorabilia hobby.